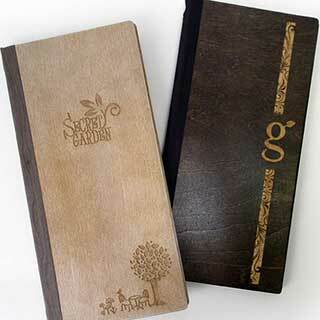 Slim size wooden menu covers with tag fixing. These sturdy wooden menu covers are made from strong thick wood. Our new wooden menus covers are available in three colours, dark wood, light wood and white wood. Three sizes are available, A4, A5 and slim, which can be personalised using your own logo or design to stunning effect. Personalisation can be done using engraving or coloured blocking. Our new wood blocking option imprints the wood with your design or logo using a process which gives either a matt or shiny metallic finish depending on your preference.